Do Owls Make Good Pets? 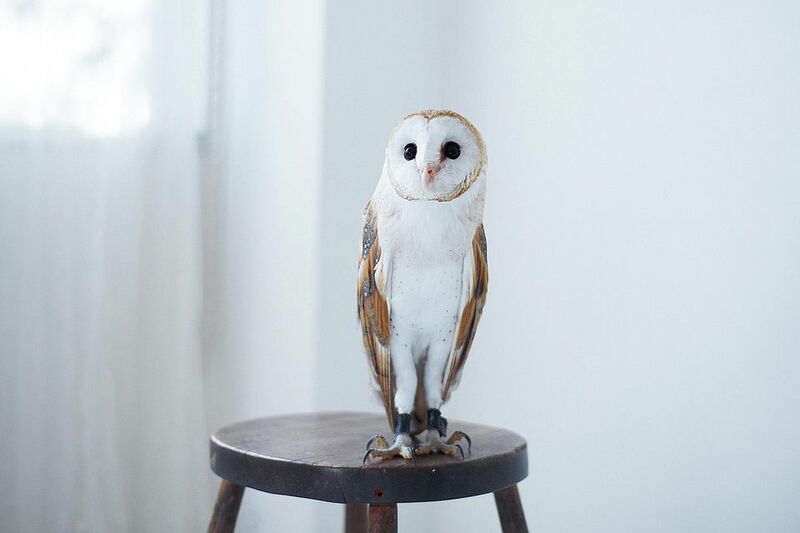 In many movies, books, and TV shows, owls are shown to be incredibly friendly, intelligent and affectionate pets. Do owls make good pets like they seem to be in the movies? And if so, what does it take to properly care for one? Can you keep one in a regular parrot cage and feed it seed and other types of commercial bird food? While it's true that pet owls have been popularized in books and movies (such as the "Harry Potter" series), the truth is that owls are not a good choice for pets. The hardships caused by properly caring for an owl are a big reason why it is best to leave them in the wild, as beautiful and captivating as these creatures may be. For starters, owls cannot be kept inside a standard indoor parrot cage. They must be kept in a large aviary with both indoor and outdoor access, as well as access to a bath pan that must be kept clean. They bathe regularly in order to keep their feathers meticulously clean. Owls fly silently, but their feathers will make noise if they are not kept clean. This noise is detrimental to their hunting. They also must be able to fly frequently if they are indeed physically able to fly. These birds are raptors that live and hunt independently. Unlike other types of large birds like macaws or cockatoos, owls do not live in flocks in the wild, making them extremely antisocial when it comes to other birds (except for their mates and their offspring). The flock mentality is what allows a parrot to successfully integrate itself into a human family. Since owls lack that sort of mindset, they view everyone except for the one person they choose as their "mate" as an enemy or prey, and will likely attack others on sight. This can be a huge problem if you ever become sick or otherwise unable to care for your owl. And since they mate for life, they may become depressed to the point of death if they are transferred to another person's care. Diet is another concern that makes it nearly impossible to successfully keep owls as pets. Since owls are technically a bird of prey, they have specialized nutritional needs that cannot be met by feeding them seeds, pellets or fresh foods like fruits and vegetables. As a matter of fact, if you presented any of these treats to an owl, he or she would likely not even recognize them as food. Owls are carnivorous creatures and must be fed whole rodents, like mice, small rabbits, guinea pigs, quail and small chickens that are commercially produced in order to meet their complex dietary needs, and must be stored frozen and then thawed before feeding or fed live. As one might imagine, this can be a less than pleasant ordeal to witness, much less to have to take part in several times per day. Like all birds, owls can be quite messy eaters, so cleaning up after meals is another chore that most people would find hard to stomach. As meat eaters, owls are equipped with a beak and talons that are specifically designed for ripping and tearing chunks of meat―and they are capable of doing quite a bit of damage to human owners if they become displeased for any reason. They are destructive and can easily rip apart anything you might have in their enclosure. It is illegal to keep owls in many areas of the world. Those who choose to defy the law and keep an owl anyway face a variety of additional problems. If the bird falls ill, there is usually no choice but to take it to a veterinarian who specializes in raptors. Your standard vet is not specially trained to treat these amazing birds. Taking an owl to a veterinarian puts an illegal owner at risk of being caught, fined and possibly jailed, as you need a permit and extensive training to become a certified and bonded professional raptor handler. If you are interested in owls, you may sponsor one at a wildlife care center. If you are looking for a companion bird, consider adopting a parrot who needs a home. They are far better suited to life with a human family than an owl. Do Parrots Get Along With Other Pets? Why Do Birds Pluck Their Feathers? Are Parakeets a Type of Parrot? Should You Mist Your Pet Bird? Should You Cover Your Bird's Cage at Night? Do Pet Birds Get Depressed? Why Are Some Birds Gender Biased? What's the Difference Between a Parrot and a Parakeet? Should You Take Your Pet Bird to the Vet Annually?